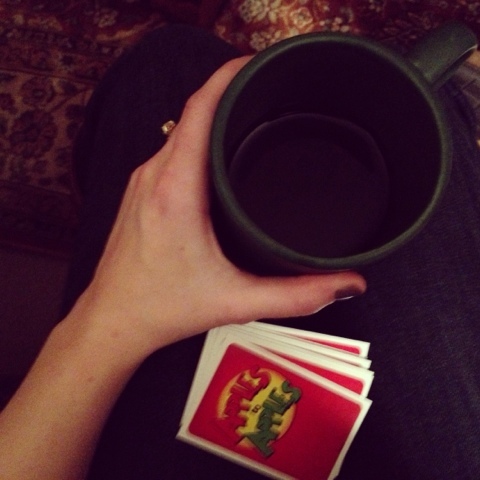 I’d been itching to make an advent calendar ever since seeing a few examples on Reading My Tea Leaves. I appreciate the advent period as a seasonal call to contemplation and anticipation, even without belonging to an organized religion. So I tried to create a simple calendar with some really easy things we could do as a family, or that I could do alone, to savor the season. At first I laid out 25 new exciting Christmas-y activities to do and then realized that sounded miserable and overwhelming. So I swapped some out for things we’d already be doing, like reading The Snowy Day or making donations to causes close to our hearts. We’re halfway through the calendar and I’m happy to report that we also just absolutely bailed on some of these. “Have an indoor picnic” sounded easy because it’s literally just eating dinner on the floor, but nope, it didn’t happen. We read exactly three sentences of The Polar Express before Clark requested a book about dinosaurs. I haven’t send out our Christmas cards yet and we’ve switched some other ones around too. It’s delightfully low-pressure. Clark is only two, so we have at least another Christmas before he’ll understand what this all is, but I’ve been thinking about the difference between acts of charity and acts of justice. So many of us enter the holiday season with beautiful intentions of “giving back”, but many of us don’t quite get it right. Consider the shift from thinking of a donation to Toys for Tots as a “good deed” to understanding it to be a small step towards a fairer, more just world. A reminder that it’s usually not about a family being “less fortunate” than it is about structural racism or other discrimination along with a broken economy, health care system and government. I’ll admit that I’ve really enjoyed filling the Christmas wish lists of some of our neighbors, but I’m trying to see it not as an exceptional act of generosity but as the only responsible way to move through this gift-giving season. Once I began to see my role in those forces that contribute to “less fortunate” situations, I had to start shifting away from the “good deeds” mentality to one more akin to reparations and justice-building actions. So, all of that to say, this has been on my mind as we move through the holiday giving season. Back to the list. Here are our advent calendar activities. Family ideas with a toddler can be tough, so some of them are just for Chris and I, some are for all three and some are just for me. I think I’d love an advent calendar with ideas just for me, but I’ll save that for another year. Nothing yet! Something festive. Something leftover from earlier in the month. Cookies for Santa. Staying up late to look at the Christmas tree. Do you have any advent calendar ideas or traditions to share? As I mentioned above, this one borrows heavily in both style and substance from the ones that Erin has shared over on Reading My Tea Leaves (an updated clutter-free one, a peace and justice one and her original). I love their simplicity and thoughtfulness. Well! Here's hoping that everyone has had a nice holiday season so far. It's been a blur of a month for me, with the wedding and a busy work schedule and the holidays. Lots of exciting things happening all around me. I'm trying to make time to sit and write about it all so I don't lose a bit of it. I am feeling particularly grateful for the opportunity to work where I do. You can read more about what we've been up to in 2012 over here. I'm also feeling pretty thankful for my marriage. Oh goodness, we're married. We are so happy to have been so supported through the entire process. To have family and friends who understood what we wanted our wedding to look like and didn't fret when we mentioned in late August that we would like to be married by the end of the year. Who knew that it was not only possible, but also thought it was quite lovely. I've been writing down my thoughts on these crazy few months and hope to share some of them soon. 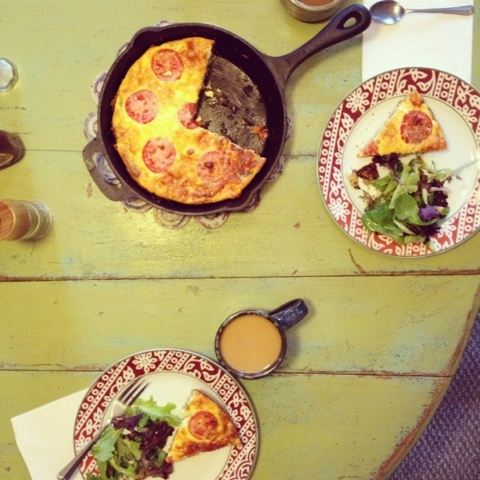 In the meantime, we've been making frittata, visiting family and sipping on mulled wine, spiked eggnog and homemade Irish cream. 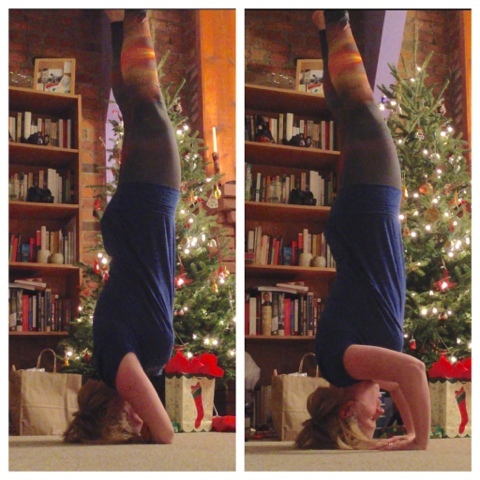 I've also been working on a few new variations on headstand and trying not to knock down our Christmas tree in the process. Oh and for anyone tired of these iPhone photos, I'd like to let you know that one of my resolutions for the new year is to use my actual camera more. I have a shiny new lens for my Canon and am ready to cut back on my Instagram and VSCO cam reliance.